"While Rudolf Barshai made his reputation in the west as a conductor – above all in the music of Dmitri Shostakovich – he had already established himself as a top-flight quartet player and a viola virtuoso in his native Russia. Had his early life not been circumscribed by antisemitism and political repression, he might have achieved even more as an all-round musician of the highest accomplishment. After completing a seven-year music school course in two years, he entered the Moscow Conservatory in 1938 to study the violin with Lev Zeitlin, who laid the foundation of his magnificent technique. However, he wanted to form a full-time string quartet, and for that needed a good viola player, so he set about fulfilling the role himself, studying with Vadim Borisovsky, who revolutionized viola teaching in the Soviet Union. Much as William Primrose had in relation to Lionel Tertis in the west, he brought a new flexibility and virtuosity to bear on the instrument. He also studied conducting with Ilya Musin and composition with Shostakovich. 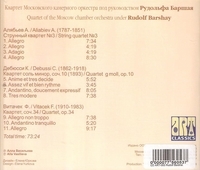 The Moscow Philharmonic Quartet, as it was initially called, made its début in 1945 with Barshai's wife, Nina, as second violinist, Rostislav Dubinsky as leader and Mstislav Rostropovich (soon replaced by Valentin Berlinsky) as cellist. All were still students, and Barshai himself did not graduate until 1948. But by then, they had already established a working relationship with Shostakovich, who coached the players and performed his Piano Quintet with them from the manuscript. During a rehearsal, Barshai made a wrong entry. The composer was so delighted with the effect that he wrote it into the score. In 1953 the quartet played at the funerals of Stalin and Prokofiev, who had both died on 5 March. Nina and Rudolf withdrew from what now became the Borodin Quartet, and Rudolf joined the new Tchaikovsky Quartet, led by Yulian Sitkovetsky. This even more brilliant ensemble was short lived, because in 1958 Sitkovetsky died of cancer, aged 34. In the meantime, in spite of the prevailing antisemitism, Barshai had become the leading viola soloist in the USSR, playing a fine Stradivarius which had belonged to Henri Vieuxtemps. His many recordings from this period included magnificent accounts of the Bach Chaconne and Hindemith's big solo Sonata. In addition to recordings with his two quartets, he appeared on others as a member of all-star ensembles organised by the violinist Leonid Kogan, among them Fauré's c minor Piano Quartet, with Emil Gilels at the piano, selected Beethoven string trios and the Tchaikovsky Sextet, the latter perhaps the finest collective example of Russian string playing on record. Barshai also taught at the Moscow Conservatory, and in 1955 started the Moscow Chamber Orchestra (MCO) as a part-time venture, gathering friends round him and working for six months before giving a concert. Within a year the MCO was granted official status, working with the finest Soviet soloists: Gilels, Kogan, pianist Sviatoslav Richter, violinist David Oistrakh and the trumpeter Timofei Dokshitser. For the smaller Baroque works the players stood, except for the cellists, and the repertory extended to Haydn, Mozart and Schubert. In the early years Barshai appeared with the orchestra as violin and viola soloist, in concert and on record. With Oistrakh, he recorded Mozart's Sinfonia Concertante, and on the MCO's first visit to Britain in 1962 he recorded it again with Yehudi Menuhin. He also directed the MCO and Menuhin's Bath Festival Orchestra in a still unsurpassed record of Tippett's Concerto for Double String Orchestra. As the MCO's expanding repertoire absorbed more of his energies, he wound down his playing activities, but not before he had recorded Berlioz's HAROLD IN ITALY with Oistrakh conducting. The MCO played Bartók's Divertimento, and Barshai had close links with a number of Soviet composers, notably Boris Tchaikovsky, Moisei Vainberg and Alexander Lokshin. The high point of this phase was the 1969 premiere of Shostakovich's 14th Symphony. Another landmark was a superb recording of Mozart's symphony cycle, the first to include all the repeats, although some were cut in western releases. Barshai's interpretations of the last five symphonies were among the finest ever recorded, culminating in a colossal – but always perfectly scaled – account of the fugal finale of the ‘Jupiter’. A Beethoven symphony cycle was also successful, although there his attention to detail was sometimes self-defeating. From 1967 he conducted other orchestras and, along with Kyrill Kondrashin, was responsible for popularizing Mahler's music in the USSR. However, invitations to guest-conduct foreign orchestras were generally refused by the Gosconcert agency without reference to him. Sometimes the MCO was sent on tour without him, with a stooge in charge. His third marriage was even undermined by KGB misinformation, given to his Japanese wife, Teruko Soda, while he was on tour. His second wife had been the Russian artist and costume designer Anna Martinson, and he had a son by each. By the mid-1970's he had had enough, and applied to work abroad for a year. Told that he could go for good or not at all, in 1976 he emigrated to Israel, where he worked with the Israel Chamber Orchestra until 1981. Suddenly, he became a man without a past. The country of his birth disowned him; his name was removed from history books and even from the sleeves of his records; the Borodin Quartet and Moscow Chamber Orchestra toured without mentioning him in their programme material; and when a Soviet biography of Shostakovich was published in the west, Barshai, like his fellow emigres Kondrashin and Rostropovich, was absent from its pages. Although he patiently rebuilt his career as a conductor and still had many successes to come, his concerts never again generated the excitement they had raised in the 1950's and 60's. He was chief conductor of the Bournemouth Symphony Orchestra (1982-88), but in general British musicians did not take kindly to his perfectionism – the members of one chamber orchestra nicknamed him ‘Dr No’. ‘He was wonderful to play for, but he was not as good a conductor technically as he was musically, and so he used to explain a lot’, said a fellow violist who often played under him. ‘Some orchestras don't like that’. He was also music director of the Vancouver Symphony Orchestra (1985-88).